Last night I was invited to taste a range of new cocktails on the fabulous drinks menu at Bar Impossible in Manchester. Held in association with Viper's 'Trading Floor', the night gave guests the opportunity to not only sample the new cocktail menu but also to redeem a free cocktail of their choice from the menu, using the infamous Viper Dollar. I opted for the 'Geisha Garden', a lychee-based cocktail which was beautifully presented in a martini glass and topped with a flower for added effect. I loved this cocktail - it was quite sweet but you could still taste the alcohol so it wasn't sickly! I would definitely recommend this. Also on the menu was the 'French Martini' which was very fruity. It had the after taste of (what I can describe as) a purple starburst which gave it a sweet kick. This cocktail was again presented in a martini glass and topped with raspberries & blueberries which added a contrast of colours to the pink drink! Throughout the night there were a variety of sample cocktails circulating which gave guests a chance to try the different drinks before opting to buy. Of course, the regular Trading Floor rules applied with drinks prices fluctuating throughout the night; making them extremely reasonable when the market 'crashed'. Later in the night I had the chance to try two more cocktails of my choice. I opted for the 'Pornstar Martini' and the 'Bramble'. Impossible's Pornstar Martini was genuinely one of the best Pornstars I've ever had. It was really sweet and the texture was perfect, with the egg white creating a completely smooth layer on top. Again, the Bramble was lovely. This isn't one for the faint-hearted as it is quite a strong drink (I felt it hit me after a few sips) but it was really flavoursome. I particularly liked the presentation of this cocktail. 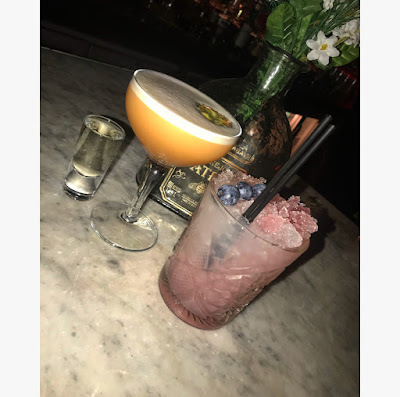 I loved experiencing Impossible's new menu with some of my favourite people and would definitely recommend the above cocktails to anyone wanting to visit. The taste, texture and presentation of each was spot on and I was really impressed. Thanks as always to Viper for looking after me and making the night so much fun!